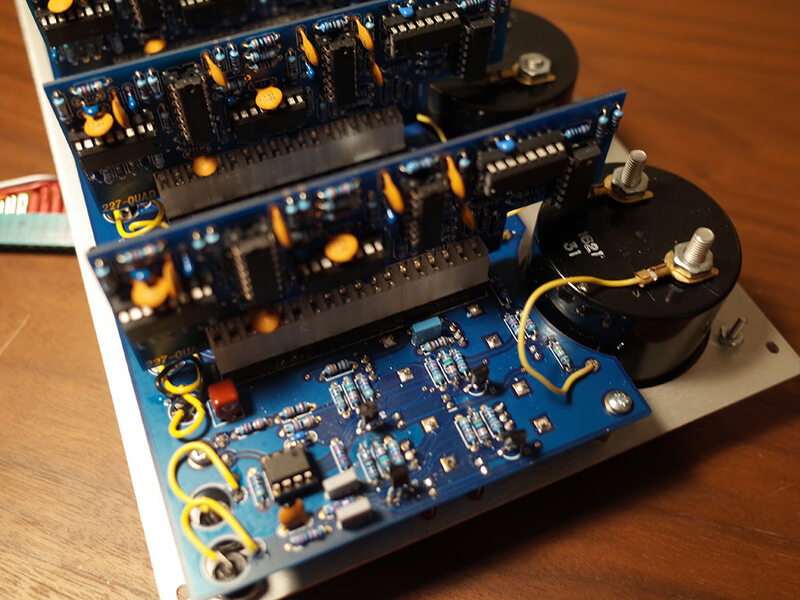 MUFF WIGGLER :: View topic - Has anyone done a Buchla 227 clone? Has anyone done a Buchla 227 clone? Hi - I was wondering if anyone had created anything resembling the 227, particularly the spacial distribution section. I'm considering working on such a project, using SSM2164 quad VCAs to do the distribution, but am trying to figure out how to do the control signals, which have to convert a standard CV into 4 subvoltages. the newer revs of the 227e use 2164's instead of led/ldr pairs for the quad outputs of each channel. It looks like the part I'm interested in is on page 1 of that schematic. There's a bunch of circuitry where "X" and "Y" are used in various ways to distribute the signal among the various channels. What 'X" and "Y" are is elusive though. And what the heck are those FETs doing in there? I think I read somewhere about a way to use FETs to bias an opamp into it's most linear region, but I don't recall the details. The use of solid state chips instead of Vactrols for the VCAs makes good sense. Vactrols probably didn't impart and special sound quality in that application. On the 227e X and y are literally the position of the sound in quad space with the origin at left rear (ie at x=0 the sound is hard panned to the left, at vref the sound is hard panned to the right). When swirl is enabled x is the rate of change (at vref/2 the sound doesn't move; at 0v othe sound moves quickly to the left and at vref the sound moves quickly to the right). Y is the radius of the rotation. This is one reason why vactrols are nice in this circuit since doing equal powered panning in two dimensions is much easier with the linearish response of a vactrol instead of the expo response of the 2164 (actually don told me the reason he used them there was because when he designed the 227e there wasn't a quality quad vca available). Sorry I don't know the specifics about the 227 but I can definitely answer more about the math of doing this (swirl / pan) with a 2164. This schematic is repeated 4 times for each quad panning block. X and Y are the control voltages for x-axis and y-axis panning. I don't know electronics deep enough to really see how this is working-- but I do see the 4016 Quad Bilateral Switch which is gating these two voltages on and off by control of the "assign" pot voltage. It looks like they're then inverted (and scaled?) and sent to the vactrol vcas. The crazy little 3D graphic at the top represents where (-)x and (-)y voltages are enabled . It says "ext inputs enabled" along one axis, and "assign voltage input" anong the other axis. Vactrols make good sense too, particularly where many VCAs are needed. They make extremely quiet, low parts count amplifiers. Thanks guys, it's starting to come into focus for me now. It looks like each of those vactrol stages also acts as an invertor, so you feed -X into one, and it comes out +X on the other side, and THAT signal gets summed into another stage. Damn that's some clever stuff. One detail - do you know what the little boxes are that have an 'X' inside them on the left side of page 1? They have 3 legs each. Are those multipliers, switches, or ????? did you end up making this project? If so would you want yo share some schematics or details? Google "Sergio Franco Hardware Design of a Real-time Musical System"
I have a downloaded PDF from years ago. It was his Doctoral Thesis long ago IIRC. Goes into detail on the design of a quad mixer/locator. I have now bought the wrong VU meters not once, but twice on eBay. 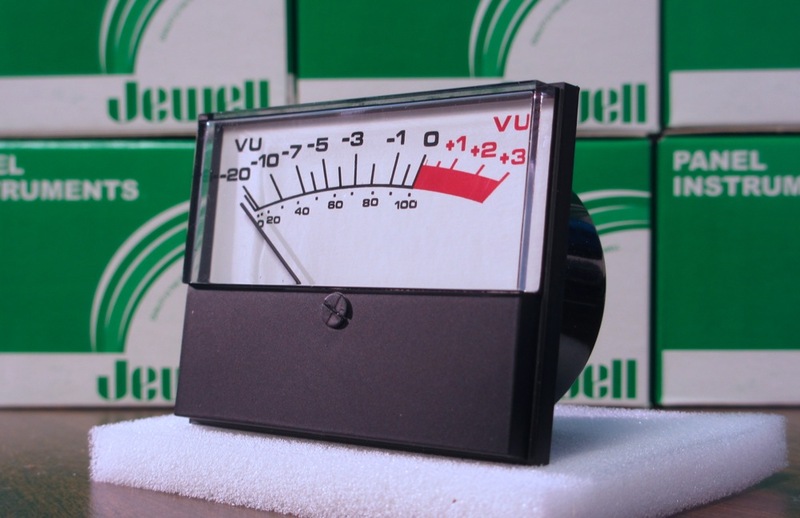 What is the correct model number Modutec VU meters? Side note, I have 2 that have shrunk by 66%, perhaps someone wants to make a smaller version of this module? The 227r rev2 BOM lists 2S-AVU-000-AW-U as the part number. Past group buy threads also include that part number. Brand is Modutec / Jewell. Thanks again, I forgot you told me this in the *other* Buchla parts thread.